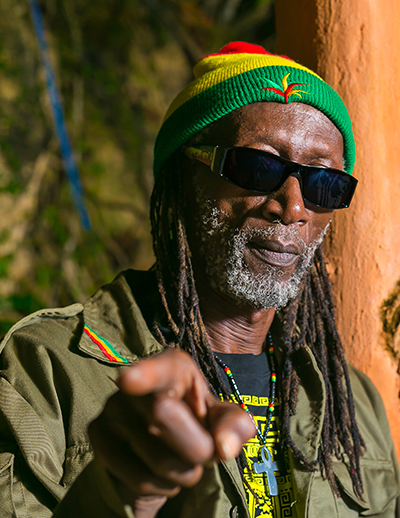 Dr IMAN.BLAK aka Don-D is a Jamaican-born Ras Tafarian. This highly achieved self published Writer, Poet, Philosopher, Psychologist, Football (soccer) Coach, Radio Personality and Cultural Studies Lecturer in the Faculty of Humanities and Education at the University of the West Indies, Mona, Jamaica, is respected by the masses whom are inspired by his unreservedness towards positive freedom of expression. His publications include Black Philosophy and Poetry (1978), The Intellectual Roots of JAH Ras Tafari (1994), The Histo-Cultural Evolution of the Races (1996) and Black Poetry Volumes 1, 2 & 3. Since January 1980 IMAN.BLAK has been in self-imposed exile from A Merry Ka ...in Jah Mek Ya... after surviving the decade of the 1970s in the U.S. of A.
Dr. Blak inspires people of all ages and races to ‘come to know’ what he calls the “I”. He hosts and produces a radio programme named The Metamorphosis on Stylz FM; where his enigmatic character garners impressive listeners of the teachings.